Taupo Central, Lake Front, Hot Water Beach. Absolute Beach Front on Hot Water Beach, Waipahihi Bay, Lockwood Home situated 20 metres from Lake edge, sandy beach and safe swimming. Close to 2 Mile boat ramp. Taupo Township 2 min drive or 20 min walk. View the Mountains and Rangiteria Point, and enjoy the magnificent sunsets across the lake. Ski Mt Ruapehu and come back to our holiday home for a soak in the indoor Thermal Hot Pool, or if you just need a break and need to relax, this is where you need to be. 2 NIGHT MINIMUM STAY. $250.00 per night TWO NIGHT minimum stay. Check in time 2pm. NB: 2 single beds in BR 2 and 3 can be zipped together to make a superking. Bath house instructions on wall. 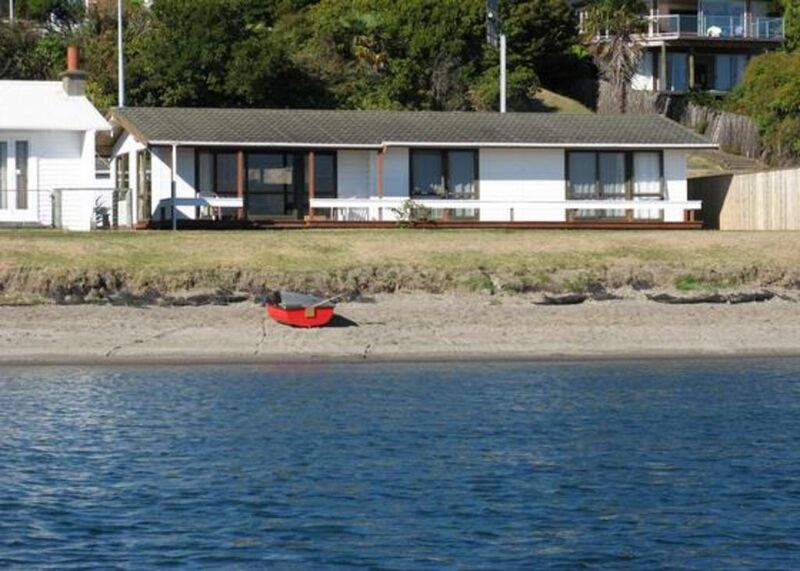 Very nice location right beside the great Lake Taupo! Property was so well situated, a hop skip and jump away from the town centre, a wee run away from the 2 mile bay boat ramp, perfect when you have jet skis that can stay in front of the property all day. The spare land next door made it great for a wee game of touch rugby, was a perfect getaway spot! Absolute pearl of a spot for a family holiday. We stayed at this lake front bach for a weekend getaway with our four children. The children enjoyed being right on the lake and finding all the thermal hot spots while swimming. My husband and I loved the thermal spa and amazing views. We took our bikes and scooters and it was fantastic to ride along the path, literally on the back doorstep, right into town. Great little coffee van on the way too. Bach has been well loved, it is comfortable, has everything you need, and its location is perfect. Awesome position and clean and tidy property. This is a great spot with simply AWESOME views across the lake. The kids loved the hot water beach and the hot tub. Would stay here again for sure! Great spot , very warm , very enjoyable stay.